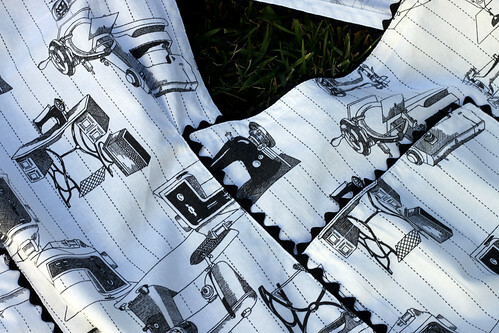 Here is another apron that I made from a vintage pattern. A girl I worked with found the pattern at an antique shop and during lunch I cut out this apron. I was taking cake decorating classes after work and needed an apron, so one thing led to the next. Something to point out is that adding the rick-rack edging takes a long time. I had to baste the rick-rack in place by machine first, then sew the bias binding on, finally top-stitching around twice. 4 times around every edge is a lot of sewing. I like the way the rick-rack looks. 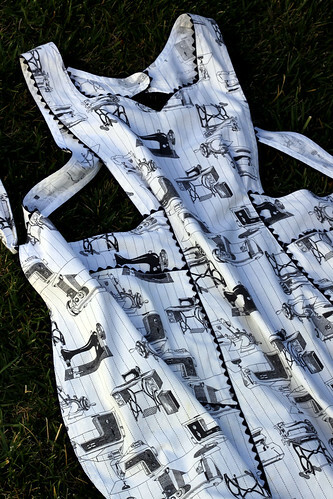 Since this apron has sewing machines on it, I use to cover the dress form in my sewing room now. It is worn from use, but still is in pretty good condition. This entry was posted on Thursday, July 16th, 2009 at 3:00 am and is filed under Sewing. Tagged: Sewing. You can feed this entry. You can leave a response, or trackback from your own site. OH, that is cute, too! Hi there! I just came back over to say thank you for entering my giveaway! Good luck to you! How cute! I think I like it better than the last one – wasn’t sure that was possible!